Life is full of contradictions. How can a house that’s been a residence for 117 years be the only one on the block not zoned as a residence? How can a salad you can make at the last minute have an ingredient it takes about two days to make? I will tell you how. What appear to be contradictions are actually opportunities to see into the true nature of things: that a house is a residence and a home, no matter the zoning, and that all things that seem to happen suddenly have a slow moving component that we either don’t recognize or dismiss. This salad came into being within the space of 5 minutes, when I discovered I was still hungry after eating a Sprouted Buckwheat Sunshine Burger and a carrot after poking around in the yard. I literally threw it together. The dressing was something I had toyed with in my mind, but not actually made yet. The sprouted quinoa was one of my successful science experiments. 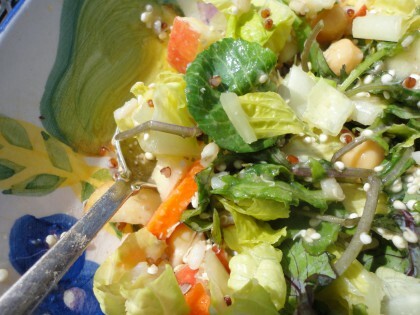 Put all the dressing ingredients in the bowl you’ll eat your salad in. Mash them together with a fork until the banana and mis are combined and have a smooth consistency. Place the fistfuls of baby kale in your salad bowl with the dressing at the bottom. Massage the kale into the dressing. 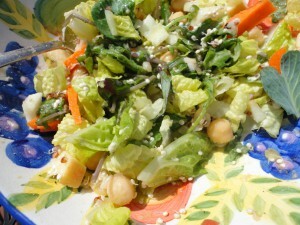 Add the chopped romaine, apple, onion, and chickpeas. Toss everything until coated with the dressing. Sprinkle on the sprouted quinoa. Dig in. Note: If you don’t want to embark on an adventure with sprouting quinoa, you can use cooked quinoa instead. 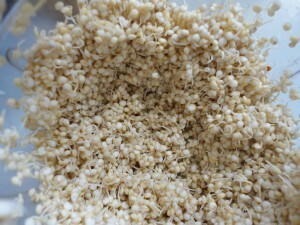 My method for sprouting quinoa is strongly influenced by this one at Sprout People. They know all about this sort of thing. Here’s a video about sprouting beans that demonstrates some good general practices. Some other sources say to use filtered water. Some say you don’t have to soak quinoa very long. Since it’s so dry here, and I do everything in slow motion, especially if I have a lot of balls in the air like I do these days, I soaked my quinoa for about 24 hours in Spring water, then rinsed it well several times and let it sprout for another 24, rinsing once sometime in the middle of that. You could also change rinse water once in the 24 hours. Sometimes I do that too. It’s basically pretty foolproof. Although you can buy screens and sprouters, you don’t really even need the cheap plastic sprouting lids I bought for less than 5 bucks. All you need is a wide mouth quart mason jar, a piece of cheesecloth to cover the top and a rubber band or a canning lid ring to secure it in place. You can prop the jars at an angle with a towel in a pie plate to help drain after rinsing. I haven’t been very fussy about it, everything has sprouted and I’m getting to have some fun new taste and nutritional experiences. Generally speaking, the sprouts are lighter and easier to digest, but higher in protein than their unsprouted counterparts. Good in busy times like the ones I’m having now. And you can cook ’em if you want to, or eat ’em raw. I do both. Since I’m moving, and gardening continuity will be disrupted at both the old and the new house, I’m really enjoying sprouting things every day on the kitchen counter. I’m loving the adventure of new shoots and new starts to go with my new house adventures. And my old house has always loved to help plants, animals and people grow. I’m as happy as can be to say that I’ve accepted an offer from the perfect buyer, who will continue it’s fine traditions in her own special style. Contingent on the rezone, of course, but the great news about that is the city planner in charge is recommending approval and encouraging me on every step of the way. We should be done by mid June instead of mid July. All signs point to wonderful new beginnings all around. More details to come at some point, once I have been able to absorb them myself. Keep those good thoughts for positive results coming–they’re working!! But for now, enjoy the contradiction of a last minute salad with a two day ingredient in it. Life is just that way, almost all the time. Might as well dig in. Such good news about the zoning and a buyer! How quickly it is all happening. Hi Pam!! Yes, like a lightning bolt kind of. 🙂 I can relate to Darren’s enjoyment–it’s a lot of fun for me too. I’m about to try sprouting some mung beans. I love that he brought along one of those lids–they’re sure light and easy to pack. Have sprouting lid, will travel! Really enjoying reading about your travels. Thanks for your good wishes. Another 50 days or so of the zoning process. . .but all is expected to go well. thanks again for sharing. just one quick question. When you soaked the quinoa for 24 hours, did you put it in your fridge or did you leave it out on the counter? Hi Marge! Good question. I left mine out on the counter. I always do that, with everything I’m just soaking, except almonds in the high heat of summer. But it’s cool here, and dry, too. I think sprouting would be more effective if they are kept at a reasonable room temperature, rather than if they get too cold. If you do try putting them in the fridge, let us know how it goes. My quinoa sprouted really easily. That’s interesting! I never knew you eat sprouted quinoa raw. You learn something new every day. 🙂 Congrats on finding a buyer! And continued luck and happy wishes in this new adventure. I’m sure it’s a relief that the decision on the zoning has pulled in a bit. Hi Veronica–I’m no expert on sprouting, I’m just experimenting, learning as I go, too, but from what I’ve read you can do both. Cooked might be easier to digest? Not sure. Opinions about that probably differ between those who are all raw and those that aren’t. And thanks for your well wishes about the buyer and the new adventure, and yes, although I have to go through the steps, the rezoning is expected to go well. I really appreciate all your positive thoughts and sentiments, and hope you are enjoying settling in to your own new place. Great recipe! You could vary it endlessly just by using different sprouts. broccoli sprouts have a wonderful spicy flavor that would work well. I’m not sure about using a mason jar for sprouting, however. The only times I’ve had mold problems with sprouting was using jars. Since I switched to help sproutbags from http://www.sproutman.com I haven’t had a single mold problem in about 4 years. If you use jars long enough, you will have a mold or bacteria problem. Be careful and thank you for the inspiration. You are welcome, and thanks for the tips Bryan!